Don't Set Goals To Change Your Habits: Make Resolutions | Good Life. Better. The first time I heard someone say they only “set goals” instead of “making resolutions” because they never kept their resolutions, I am pretty sure I rolled my eyes. 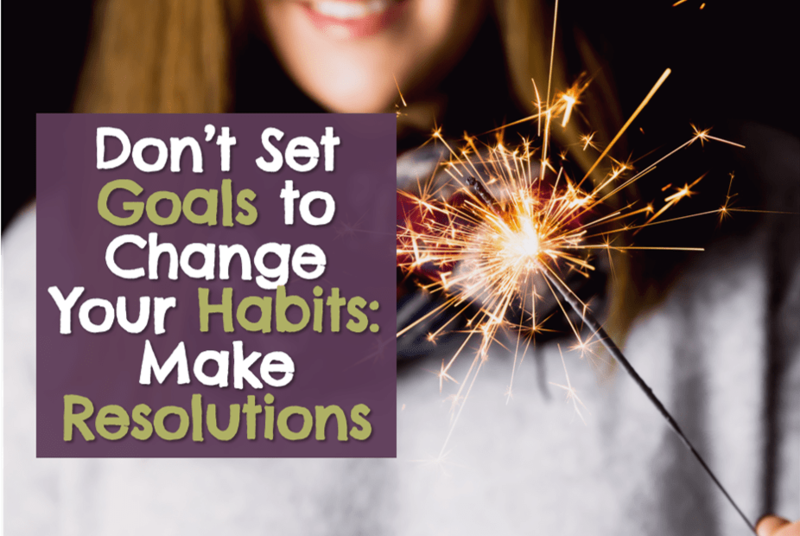 Aren’t resolutions and goals the same thing? Now, I feel like I owe that person an apology. Through my own trial and error, I believe they were on to something. 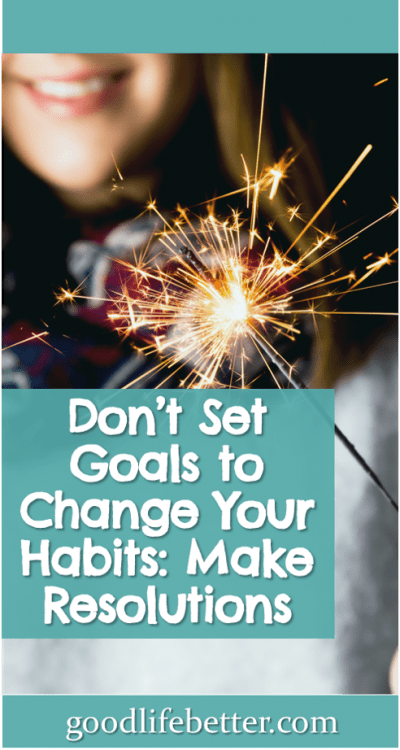 Unfortunately, in coming down on the side of goals, they backed the wrong horse: if you are trying to change your habits, it is far better to make resolutions than to set goals. Think about how many times you “set” something on a daily basis. You set your coffee cup on the counter. You set the timer on microwave. You set the dishwasher to turn on in the middle of the night (an amazing invention, BTW). Each day, you “set and forget” any number of things without really thinking about it because these actions are part of your routine, because they are automatic. “Setting” is great for tasks that are already habits. What it is not good for are novel activities you want to become habits. Contrast this with resolving to be or to do something different. When I resolve to accomplish something, it means I have skin in the game. I have taken action, making a commitment to myself to change, and my pride is on the line even if I am the only one who knows about it. That said, due to their association with the New Year, I can totally understand why resolutions get a bad rap. How many people joke about how empty the gyms are come February? But resolutions aren’t the existential equivalent of fruitcake. A fruitcake in July is still a fruitcake. But a well-timed resolution can be life changing. Changing something about yourself is HARD. It requires huge investments of energy (and maybe time depending on what you are trying to change). This means you need to be intentional about how you go about it, and do your research to ensure the timing is aligned with your ability and desire to get the thing done. An external factor—such as a change in the calendar—will never be enough by itself. How do you know when the timing is right? While I am not a scientist, I work with a lot of them and over the years have picked up a thing or two. One thing I have learned about is a theory of behavior change that I think is spot on. Pre-contemplation, which means the person doesn’t think they need to change their behavior (a.k.a. denial). Contemplation, which is when the person acknowledges that there are negative consequences to a behavior but are on the fence about whether they want to make a change. This is a time of reflection, not action. Preparation/Determination, which is when the person has decided that they want to change and is researching what steps they should take. Action, which is when the person believes they can change and implements what they have learned. Maintenance, which is when the person maintains the new habit, integrating it into their routine. Resolve to change your behavior in the wrong stage—or set a goal for that matter—and the likelihood of persevering is low. But do it in the right stage and you can be unstoppable! When you are ready to take action, there are things you can do that will improve your chances of success. Identify your top priorities and focus on them. You only have so much energy to invest and if you have too many things to think about at once, you may sabotage your efforts. Watch no more than 2 hours of television per day. Write your resolutions down and track your success. This last one is a must. 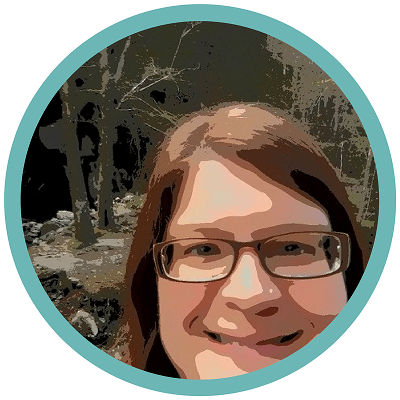 I know from personal experience (see this post on how I got unstuck) that when you finally enter the “action” stage you feel amazingly energized and excited about all that you are going to get done. I also know that life will inevitably get in the way. A visual reminder keeps your resolutions front and center. You can even use stickers to reward your awesomeness! Don’t believe me? Below is my personal resolutions chart where I am tracking my progress. I am mostly killing it with the exception of going to bed on time, consistently meeting my exercise goals, and meditating daily. Of the three, meditating is the one for which I am doing the worst. I think one reason for this goes back to the Stages of Change model above. In theory, I can see the benefits but based on my experience, I am less sure. This means I am in still in the contemplation/determination stage for this particular resolution and explains why I am struggling to take action. Are you ready to take action? 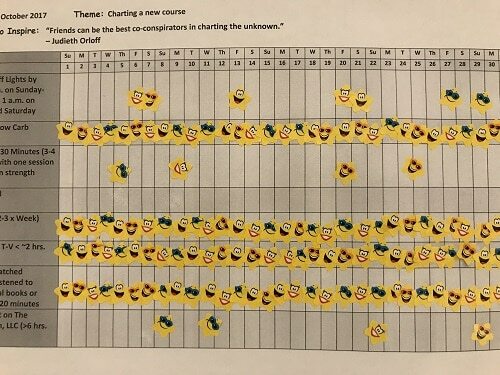 If so, I have created a FREE eCourse called 90 Days to Your Better Life that walks you through the steps above and provides templates you can use to identify your resolutions (including the tracking chart shown above). Sign up using the form in the sidebar on the right. 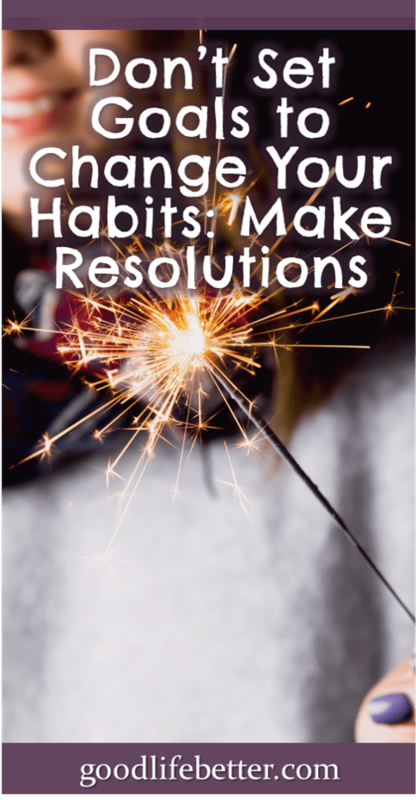 And let me know what resolutions you make in the comments section below! Goodluck Jenny – I look forward to learning from you. Thank you! And I look forward to learning along with all my fellow bloggers too! I LOVE this so much. I really appreciate you defining the stages of change. I have been on a mindset shift journey over the last few months and realize this has made all the difference in me moving from the preparation to the action and ultimately maintenance stage! Thanks for the amazing content you’re putting out in the world! You are so welcome! The stages of change help me understand why sometimes it’s like pulling teeth to get myself to do stuff and other times it’s effortless. I’m glad it’s working for you. Good luck in what your are working to accomplish!